Bhai Dooj signifies the eternal bond of brother and sister; of course after Raksha Bandhan. Today, on November 13, this wonderful festival will be celebrated. Also known as Yama Dwitiya, it is celebrate on the second day of Kartik month’s bright fortnight. Let’s know the right Muhurat to Tilak the brothers of the sisters on this beautiful day. As per the legend, Yamuna had offered food to her brother Yama on this day. Being satisfied with the hospitality of his sister, Yama gave her the boon that whosoever will bathe in Yamuna today and see the Moon before sunrise shall not be taken to the Yama Lok. Hence, Yama Dwitiya is celebrated; it has been mentioned in Skanda Purana. If sisters feeds her brother with her hands, it increases the life of the brother and relieves his problems. Let’s know how to celebrate Bhai Duj. Wake up before sunrise and seen the Moon. Now, at the right Muhurat, take a plate to keep worship material and put vermillion, sandal, rice (raw, unbroken), and sweets in it. After that, place a betel leaf over his painted hands. Now, sprinkle a little water over the hands slowly for 5 times. It is the time to put Tilak (mark) over the forehead with vermilion and rice. Now, perform the Aarti of your brother and offer him sweets. 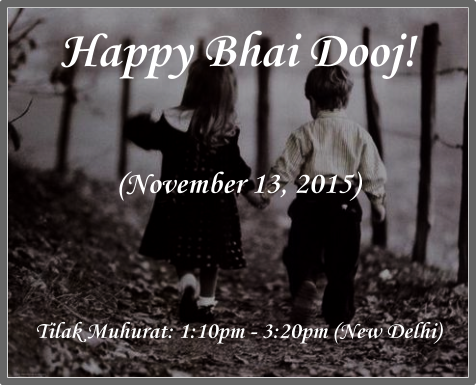 Plan your next year’s Bhai Dooj ahead: When is Bhai Dooj in 2016? Other than Bhai Dooj, this day is also celebrated as Chitragupta Puja. So, this was all we had for you. Make the best use of this information. We wish you a very Happy Bhai Dooj and Chitragupta Puja. The nation will celebrate Jawaharlal Nehru’s birthday as Children’s Day tomorrow. Chhath Puja is beginning from November 15, 2015. On this day, sunrise will take place at 6:42am and sunset will occur at 5:27pm. Ganesha lovers will celebrate Vinayaka Chaturthi on this day.